The common expectation surrounding students and education is that students will advance in their literacy ability as they progress through school. Although there is support for this expectation from large scale longitudinal studies, for some middle school students, advancement in literacy ability is not always the case. The transition from primary to secondary school is identified as a particular challenge for some students and there is evidence that not all students make this transition successfully and, as a consequence, their academic progression may stall or in some instances, decline. 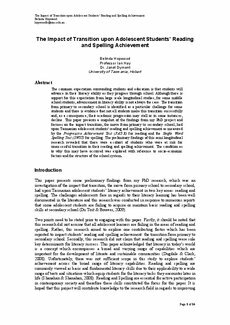 This paper presents a snapshot of the findings from my PhD project and focuses on the impact transition, the move from primary to secondary school, had upon Tasmanian adolescent students' reading and spelling achievement as measured by the Progressive Achievement Test (PAT-R) for reading and the Single Word Spelling Test (SWST) for spelling. The preliminary findings of this semi longitudinal research revealed that there were a cohort of students who were at risk for unsuccessful transition in their reading and spelling achievement. The condition as to why this may have occurred was explored with reference to socio-economic factors and the structure of the school system.